Theoretically, there are 71,852 positions that can be obtained in chess after each player's fourth move, the vast majority of which are strategically useless. So where to start? This remarkable visualization shows how the opinions on this matter have changed over time. These graphs were put together by computer science graduate research assistant Randal Olson. He explored a data set of 650,000 chess tournament games ranging back to the 15th century, though for this project he only used data on chess games dating back to 1850. Looking at the graphic above, you can see how White's opening moves have changed, though aggression and the strategy of controlling the center have remained popular. The classic King's Pawn, in which the king's pawn is moved to e4 remains a staple, but other moves now rival it in popularity, including Queen's Pawn (Pawn to d4), the Zukertort Opening (Knight to f3), and the English Opening (Pawn to c4). Many of Black's opening moves are more defensive in nature and attempt to undermine White's initial advantage. In 1850, it was standard fare for Black to match the ever-popular King's Pawn by moving a Pawn to e5 (the Open Game). Although I typically group unpopular openings into the "Other" category, I wanted to point out the short-lived spike in popularity of the Pirc Defence in the 1850s. Though the Pirc Defence is typically thought of as a relatively new opening, Moheschunder Bannerjee used this opening almost exclusively in his 50+ games against John Cochrane, winning 40% of the games (far above his overall 24% win rate as Black). 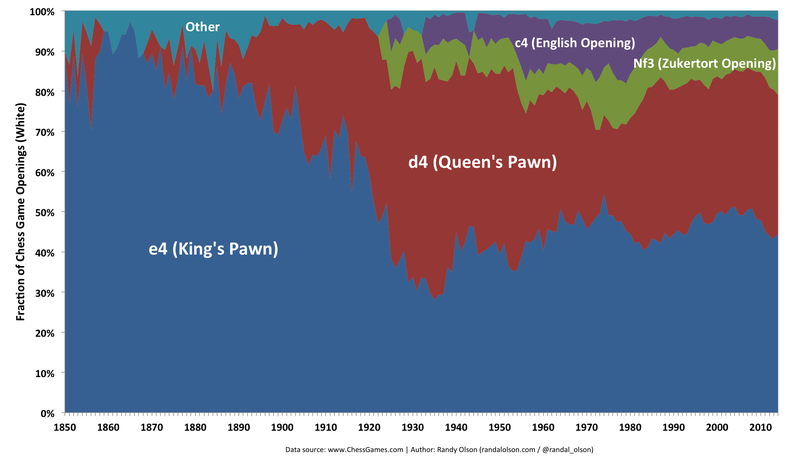 Moreover, the rise of the Queen's Pawn in the 1890s resulted in the rise of the Closed Game in the 1890s. Black openings similarly saw a burst of innovation in the 1920s, with the development of the Indian Defence in response to the Queen's Pawn, and the introduction of the ever-popular Sicilian Defence in response to the standard King's Pawn. By 2014, the Open Game is well past its glory days, and seems to be on its way out. The French Defence seems to have been a staple Black opening for the past 164 years, consistently comprising 5%-10% of all chess games. Amusingly, the French Defence has a reputation for solidity and resilience, which is also reflected in its historical usage. Read the rest of Olson's article at his blog, where he also provides visualizations and commentary for White's and Black's second move — which is when things start to get considerably more diverse in terms of the options available.